We happy to announce that we release a new version of PrestaBay Startup that includes Flash Actions with ebay listings. Minimum PHP version support by the module is 5.3.0. If you have a lower version, ask your hosting for an update. One of the biggest changes we release to PrestaBay module. With releasing "Flash Actions" PrestaBay module can perform ebay operations in the background. This should increase the speed of synchronization execution, reduce the time for sending the whole catalog to ebay, have better synchronization between PrestaShop and ebay. To give you better understand what Flash Actions is about we create a video where we send 400 items to ebay using this Flash Actions. "Flash Actions" include new actions button for "Selling List: Overview" page, "Selling List: Edit" page and "Flash Action" dashboard. Also "QTY/Price Revise" Flash Action was integrated into Synchronization process. Additional to the main feature we update our infrastructure used for executing synchronization tasks and executed cron job. In updated version, every synchronization task could execute in its' own time interval. All important synchronizations tasks still executed every 5 minutes, but the less important task could execute every 15 minutes, every 30 minutes or only once per day. Revise - every 5 minutes [new task]. Task was separated from previus tasks in order to speed up synchronization process. Aslo this task could use "Flash Actions" for do fast revise for all items that need to be revised. Additionally, synchronization log start shows information when synchronization was executed and how long it takes. Also, it displays information what task is start executed and what finished. In order to follow PrestaShop guideline, we rebuild module menu. Now inside the module, you will find a standard PrestaShop menu that includes all our items. Please notice there changes of some item location. For example "Accounts" and "Marketplaces" you can find in the Configuration page. Another example, all logs is located under "Items Log". Parts compatibility is an eBay feature that uses structured data to associate compatible assemblies with parts listed on eBay. For example, parts compatibility enables sellers to specify accurately and comprehensively the vehicles on which a side mirror or a rim will fit. Parts compatibility improves search relevancy and frees up item titles and descriptions for more useful descriptions of the part. Inside PrestaBay module we add possibility set KType that used often for cart part compatibility seller. This feature available together with Item Specific in Selling Profile for categories that support it. 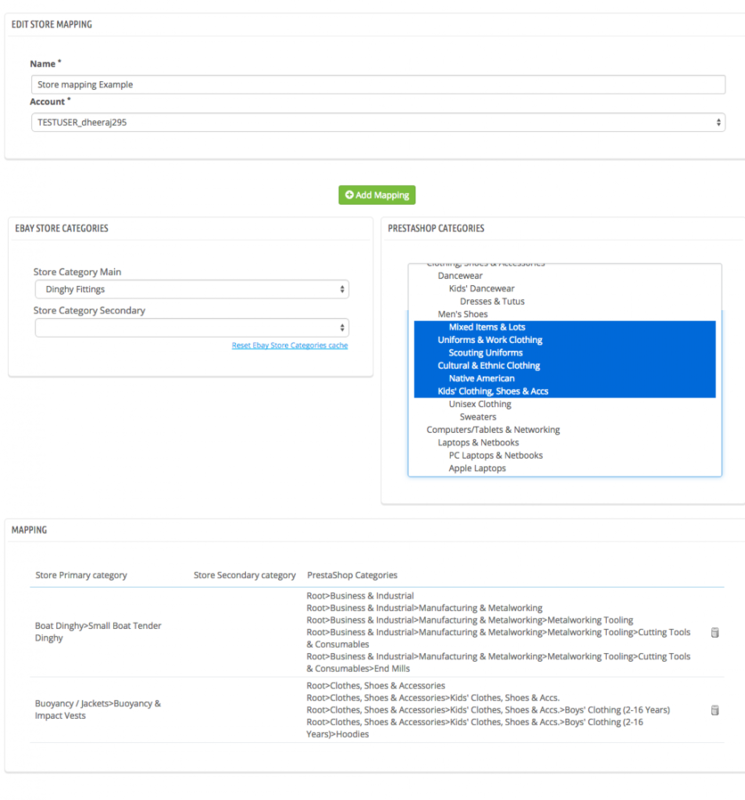 You can add single or multiple KTypes for single Selling Profile. You also can use any tags that support by PrestaBay to get from PS product. KTypes also could be defined in Category Mapping. In the way of simplifying working with Selling Profile and make it more customizable, we add two new features "Category Mapping" and "Ebay Store mapping". Mapping can be found on menu "Catalog->Ebay->Profiles->Category Mapping". During creation new mapping, you need to select marketplace for which mapping created. Then select pair between Ebay Catalog Categories and PrestaShop categories. For selected eBay category, you can choose Item Condition and Item Specific. The newly created connection will be added to the list of existing mappings. This mapping information can be used in Selling Profile. Instead of selecting eBay Categories in each Selling Profile and then fill Item specific you can create a mapping for selected marketplace and use it in Selling Profile. When PrestaShop product listed to eBay PrestaBay analyze it default category and choose eBay category based on it. Also, Item Specifics and Item Condition filled from selected mapping. Same as for Category Mapping, it's possible create connection between eBay Store categories and PrestaShop categories. As a first step, you create connection Ebay Store Category -> PrestaShop Categories. Then on Selling Profile select created a mapping as a mode for store categories.